Whether it’s a simple get together or a well-planned affair, your next party doesn’t need to take a huge chunk out of your budget. In fact, with a little creativity and planning, you can host a party that leaves your guests excited for the next gathering. 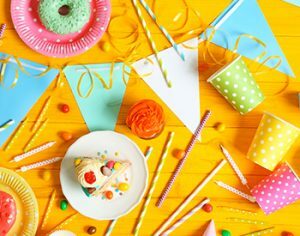 When it comes to hosting a party on a budget, starting with a theme helps establish the guidelines for what you truly need and keeps you from overspending on the non-essentials. With a theme and a budget, you can plan every detail ahead of time and leave your wallet intact. Another surefire tactic to keep your budget on track is to utilize what you already have. By using a few staple items from the pantry, rearranging the furniture and setting the mood with lighting, you can pull together a rather impressive impromptu dinner. If you are looking for ideas on planning a party without breaking the bank, the below tips are just what you need. The quickest way to burn a hole in your wallet is to run out to the store and aimlessly grab items from the shelves. It is a tactic that could lead to buying things you don’t really need. Setting a budget before shopping helps you focus on the essentials, so you can make it through the store with everything you need, all within your allotted budget. One easy way to establish a budget is to select a theme for the party. With a theme, you can focus on purchasing the foods and decorations that fit within your guidelines for the theme. You might be surprised to find that you probably already have a lot of what you need right in your home. Not only that, you would be amazed as to how little it takes to transform any space into the perfect gathering spot. Start things off by rearranging the furniture into multiple conversation areas. Repurpose side tables for serving stations or use a fireplace mantle for appetizers. Turning the lights low is a great way to set the mood. Keeping the lights low also helps take the focus off the existing décor and keep it where the focus truly belongs – on the party. A well-stocked pantry goes a long way towards hosting an impromptu dinner party or get-together without an expensive trip to the grocery store. A few boxes of pasta and a couple of jars of sauce make for a quick pasta dinner. Keeping a few extra bags of chips and cookies in the pantry gives you some easy options for an appetizer tray for last-minute gatherings. You can rack up some extra savings by shopping in bulk at a discount store. Focus on items that have a long shelf-life, so they’ll be ready when you need them. It is easy to serve up a great meal without breaking a sweat (or your wallet) if you go for low-cost, high-volume foods. The idea is to plan a menu that can feed a large group as inexpensively as possible. Ideally, that means a simple dish that does not require a lot of ingredients. Spaghetti, chili or soup work great for this. Another great option to stretch food is to serve a dish as an appetizer or finger-food. Purchasing a few large sub sandwiches and cutting them down to smaller portions make for a quick appetizer. Also, consider vegetables, cheeses and fruit as options for appetizers. Who says it needs to be a dinner party? Why not invite everyone over for an after-dinner dessert bar? That way, you are only spending money on cookies, cakes and other sweets rather than a full menu. You could also try hosting a brunch where inexpensive items such as bread, fruit, juice and coffee take center stage. When your guests offer to bring something, let them. Perhaps they can bring a side dish or a dessert. That way, you are only responsible for the main dish, which can be a huge budget saver. Another option is to make the entire occasion a potluck, where everyone brings a dish to the table. You can also suggest your guests bring their favorite beer or bottle of wine to share. Slashing your drink expenses this way lets you focus your money on other items such as food or decorations. Outside of food, drinks often take a big chunk of a party budget, especially when it comes to buying a variety of drinks that appeal to your guests. Instead of focusing on variety, however, you might try picking a signature drink for the event. Gin and tonics, long island iced teas or margaritas are excellent choices. That way, you are only spending money on the ingredients for your signature drink. Keep a non-alcoholic option on hand for those who choose not to drink. Skip the invitations and use one of the many popular email invitation apps that are available. Using one of these apps, you design the invitation, specify the guest list, input their contact information and let the app care of the rest. Everything from sending the invitations to tracking responses makes using one of these apps a real time and budget saver. Music is a great way to keep everyone entertained and there are plenty of free options to keep the party alive. Create a playlist on your device and let it play throughout the event. That way you avoid the expense of a D.J. and you won’t have to monitor the music to keep things going. Also, consider using a music streaming service. Some are free or low-cost and provide a great way to keep the entertainment lively if your music collection leaves something to be desired. Having friends over for fun is really what a great party is about. However, inviting all your friends may be impractical. You can keep things manageable when you downsize the guest list. Unfortunately, doing so could lead some of your friends feeling left out. A great way to overcome this is to make your event focused on a very specific shared interest. For example, you could host a movie night for your friends who love a good romance, or you could plan a tailgate party for friends who enjoy a sport such as football or baseball.